Out of respect for the Jackson Family and out of humility and basic courtesy for the deceased, I have chosen not to post any reports, opinions or stories on the King of Pop. You will only see evidence of Michael’s life here at The PRess Junkie. There are more speculations out than valid news and leads and I am more ashamed now to be consider as a member of the media. Mike told us a long time ago that skin color does not matter. It really doesn’t matter if you’re balck or white…but I digress. 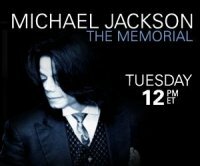 We invite you to watch the memorial of Michael Jackson on CNN and http://CNN.com/Live with Facebook Tuesday at Noon ET. Share your memories with friends and other Michael Jackson fans around the world using Facebook status updates from CNN.com Live. Rest in Peace Michael. You are greatly missed here, my brother. I am very pleased to go to this site and it be respectable to Michael Jackson and his family. Thank You! Thank you Michael for gracing us with your presence, your legency lives on; not only through your music but, the extraordinary person you were. Micheal you were human therefore not perfect but your love was unique, crossed barriers and unified this nation as evident by your fans on a national level. Love You MJ and Thank You, You did Good. May God (Father) wrap his heavenly awards around you and you are now at peace.